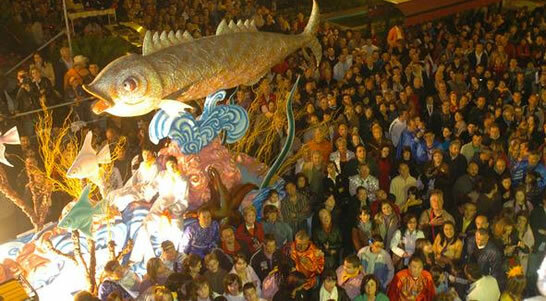 As you may be aware, Andalucia is filled with fascinating cultural events throughout the year. Whilst many of these festivals take place on the date indicated each year, others will move slightly in relation to the day of the week, the religious calendar or occasionally the weather. This bizarre ceremony takes place every year at the end of Carnaval, on Ash Wednesday, the first day of Lent. It’s an event which has its origins in history, though as always, several versions exist as to exactly who, what and when first started it off. Some say it was King Carlos III in the 18th century, who was given some rotten sardines, and ordered them to be buried. In any case, it’s a symbolic burial or destruction of the past (including the excesses of Carnaval), to allow rebirth and re-energisation (Lent). Exact activities vary from town to town, but often a group of people in black mourning clothes, some dressed as priests or nuns to officiate the “funeral”, carry a sardine through the streets (it could even be in a coffin). Then the fish is either buried or barbecued (seems a shame to waste a good sardine, although large, beautifully painted papier mache models are also used), then the eating and drinking starts, and sometimes firework displays too. Only in Spain – a party to celebrate the end of a festival. For most Catholics in Andalucia, Holy Week is the most important religious festival of the year. Processions of penitents in long robes and tall, pointed hoods walk through the streets, carrying statues of the Virgin Mary and Jesus on flower-decked floats, accompanied by brass bands and saetas. The celebrations in the main cities (the eight provincial capitals, most notably Seville, Malaga and Granada) start officially on Domingo de Ramos (Palm Sunday). Other towns and villages may hold processions on one or two days only during the week, bringing out the Virgins from their churches to be carried through the streets. Dating from the 17th century, this fiesta is one for all the family, with a countryside picnic of local specialities. The Vieja (old woman) is a brightly-coloured paper doll with sweets hidden in her head. After the meal, stones are thrown at the doll’s head until the sweets fall out. It takes place on the middle Thursday of Lent, and is intended as a midway break from the fasting of the cuaresma.